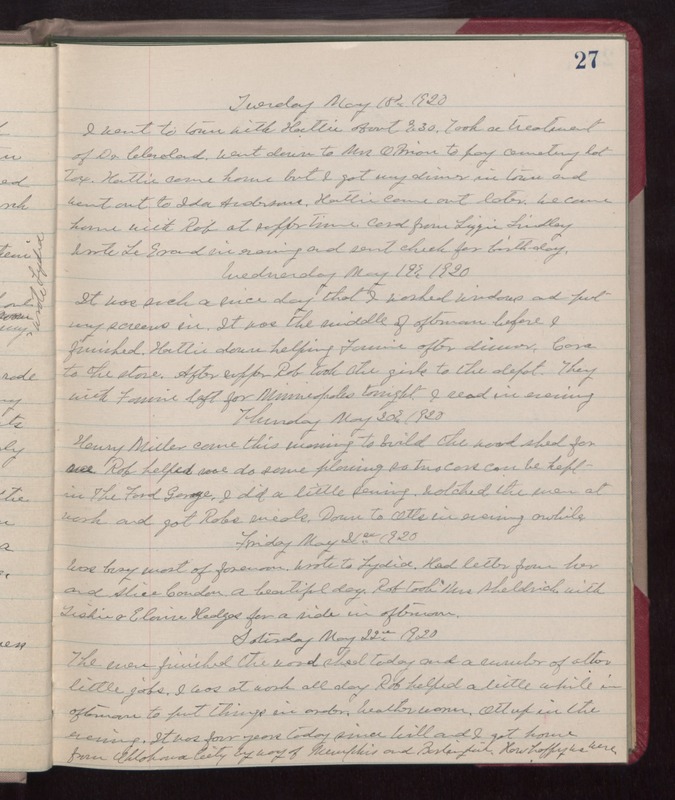 Tuesday May 18th 1920 I went to town with Hattie about 9.30. Took a treatment of Dr Cleveland. Went down to Mrs OBrian to pay cemetery lot tax. Hattie came home but I got my dinner in town and went out to Ida Andersons. Hattie came out later. We came home with Rob at supper time. Card from Lizzie Lindley. Wrote to LeGrand in evening and sent check for birthday. Wednesday May 19th 1920 It was such a nice day that I washed windows and put my screens in. It was the middle of the afternoon before I finished. Hattie down helping Fannie after dinner. Cora to the store. After supper Rob took the girls to the depot. They with Fannie left for Minneapolis tonight. I read in evening. Thursday May 20th 1920 Henry Miller came this morning to build the wood shed for me. Rob helped me do some planning so two cars can be kept in the Ford Garage. I did a little sewing. Watched the men at work and got Rob meals. Down to Otts awhile in evening. Friday May 21st 1920 Was busy most of the forenoon. Wrote to Lydia. Had letter from her and Alice Condin. A beautiful day. Rob took Mrs Sheldrick with Tishie and Eloise Hedges for a ride in afternoon. Saturday May 22nd 1920 The men finished the wood shed today and a number of other little jobs. I was at work all day. Rob helped a little while in afternoon to put things in order. Weather warm. Ott up in the evening. It was four years today since Will and I got home from Oklahoma City by way of Memphis and Burlington. How happy we were.